Google has announced it’s support in the fight against the flu. The premise is that it can use it’s database of user searches for “flu” or “flu symptoms” to predict outbreaks 7-10 days ahead of time, giving public health officials time to react. It’s interesting that Google has released this data, which likely has proprietary value. Rather than forecasting flu outbreaks or enabling my election analysis, Google could forecast consumer trends and trade stocks based on the findings, hoping to profit when the flu hits. Consider Google’s initiative to predict flu outbreaks 7-10 days ahead of time; what if Google kept their data secret and traded drug companies based on the findings. Before you shoot down this investment idea, consider that there are hundreds of similar ideas lurking in the Google data – some are certainly viable as investment theses. Alternatively, if Google didn’t want to run a hedge fund, they could probably sell their search engine data to those who do. I’m guessing it’s worth a lot of money, even on the scale of their ~$5B in yearly earnings. So why does Google give up this info for free? It may be because using it for proprietary profit would incite public outcry and contradict Google’s credo of free information. It also may be that Google does plan to use it – they’re just waiting for the right time. They control the terms on which they release the data and could control the most valuable and timely nuggets for themselves. No matter the case, this is a gray frontier for Google between their fiduciary profit motive and their avowed sense of public good. Sound familiar? This entry was posted on November 13, 2008 at 1:26 am and is filed under Uncategorized. You can follow any responses to this entry through the RSS 2.0 feed. You can leave a response, or trackback from your own site. Would like to see the chart on the left against Obama / McCains’s Intrade %. If Google truly has inside (i.e. useful) information, jumps in Google searches should PRECEDE changes in Intrade %. If not, Google searches are simply reacting to existing market info. Since MySpace is a subsidiary of a much larger organization (NewsCorp) and Facebook is privately held, there is no frequently updated market measure to compare it to. Wonder how change in user base and pageviews track against searches. And label your axes Samuel! Have your forgotten your roots? 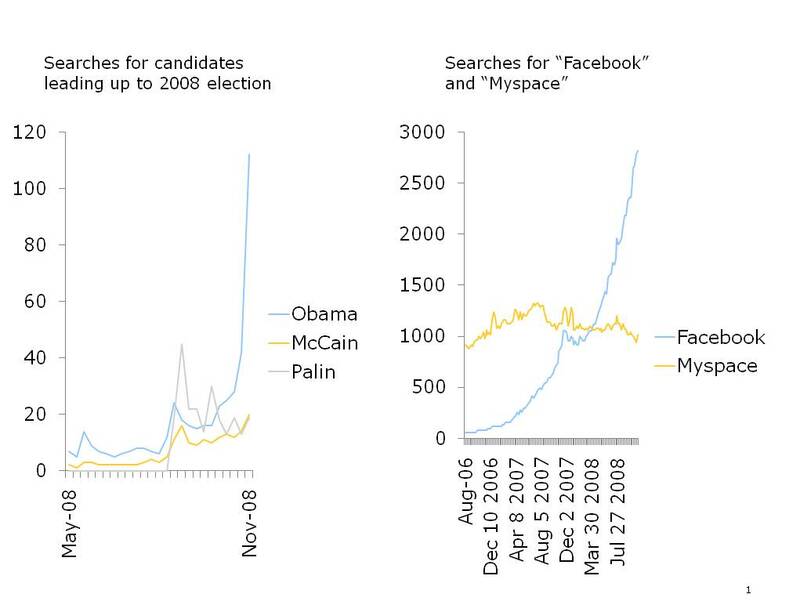 As for your first comment, you’re right that seeing the Intrade data against the Obama/McCain searches could confirm or deny the value of this particular graph as a predictor of presidential market movements. However I came up with these graphs quickly. It’s not hard to imagine that there are millions of other search words that could be interesting, of which a healthy handful are probably useful predictors of prices for tradeable assets. I’m talking about having just enough of an edge to make a few billion dollars every year. Put the best minds in the country on this, and I am very confident there is high value, given Google’s search ubiquity.